Welcome to the thriving domain of Zed Aar Exports, based in Bhagalpur, The silk city of India, a land full of beautifully designed, colorful and, captivating scarves, shawls and much more. An elegantly designed scarf can change the look of attire dramatically. A scarf not only complements your clothing but also enhances their appeal. 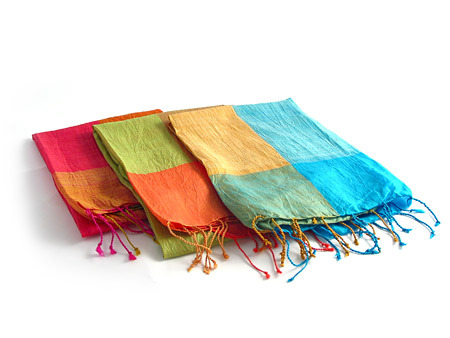 We offer all types of hand woven fabrics for your garments and home in addition to unlimited variety of scarves, shawls and stoles. With a passion for excellence and innovation, challenging sprit, organized system, competitive price and one step ahead thinking approach our company have been working in the field of manufacturing since more than 30 years. we are made-to-order company, we can copy or manufacture any design in any size/color/yarn. we are masterweaver and have complete knowledge from yarn to weaving. Based in rural india-Bhagalpur, well known as Silk City of India. We can add buyer tag or label to the scarf.